"Limited edition 180g vinyl 6 disc box set - 42 career-spanning live tracks from November 15 & 17, 2014 - featuring 2 new songs - includes digital download 44.1 kHz / 16 BIT WAV audio files". Recorded at The Stern Auditorium/Pearelman Stage at Carnegie Hall, New York, New York. Original first press with black (A to F) yellow (G to L) labels. Tracks on F and L sides are a continuous side applause and some dialog. Cat# on box and sleeves: PAX-AM 049. Digitally a bargain hi def hi res for about $30. An amazing recording that makes you feel like you're there. 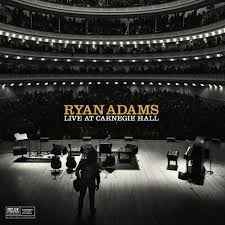 Ryan Adams is like the Billy Corgan of the nineties in regards to proclivity but actually has the solo skills to back it up. He tells great stories and his self deprecating humor makes it so much more humanising as a show. If you want to test a sound system this is one of those recording that if you turn it up and you don't feel like you're there, go and test something else. He is one of the most original recording talents at the moment that like Jack White and wilco drive me to keep buying albums. Not only one of the best sounding pressings I own, but amazed at the depth/clarity for being a live recording. This is going to be something my kids fight over when I die. This is an excellent pressing,definitely a must hear. i ask myself if this might be a bit ridiculous to buy for somewhat 120-130 euro a 6 lp Box incl. a box, and 2 triple gatefoldcover, while i am able to buy for just 20 euro a double album with 20 tracks already, regarding that the bonus tunes are partly 2 times to hear on this edition? i am wrong? versions totally different? cdalida, milehi, dedncyde, omarufo, slacker2012, stassen, the-seven-levels, Vinyl.